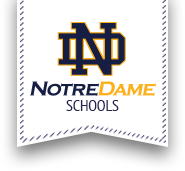 The Notre Dame Art Club will be auctioning off Adirondack chairs that will be designed and painted by our advanced artists. More than 14 creatively designed chairs will be available to win in a silent auction to support the Arts at Notre Dame! Bidding will end at 11 am with raffles and awards to follow. Tickets will also be available for a Notre Dame-themed chair via raffle. Tickets are $5 each or 3 for $10 and available in the main office of Notre Dame Jr/Sr High School. Cash prizes for 2nd and 3rd place will be awarded. Free admission, food for purchase.